There is some modern concert music where textures change so frequently, and musical gestures are so brief, that if your mind takes more than a moment to consider some turn in the musical argument you may find yourself utterly lost, and struggle against confusion while you reorient yourself. In the worst case one gives up, and boredom sets in. Contrariwise, there is also much music whose textures change so slowly, and whose gestures are so prolonged, that one’s mind becomes restless to move on, and the only way to stay focused on the moment is to fall into a zen-like state of no-mindedness, a process resembling self-hypnosis. In the worst case one gives up, and boredom sets in. 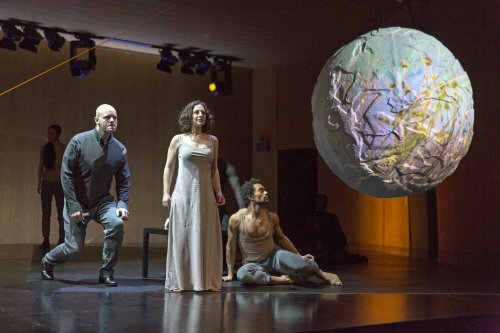 Gotham Chamber Opera’s hour-long program at the Metropolitan Museum, entitled The Tempest Songbook, took these truisms into account by alternating Shakespeare settings by the contemporary Finnish master Kajia Saariaho, with Baroque-era settings attributed to Purcell. Those who found Saariaho’s language unfamiliar or taxing were given a reassuring figured bass to fall back on, while those who found the typical Baroque Aria da Capo form tediously repetitious were never more than a few minutes away from the next of Saariaho’s elegant and colorful modernist miniatures. Soprano Jennifer Zetlan and bass-baritone Thomas Richards were both excellent, sounding completely at ease and consistently expressive in this sometimes challenging music. The ensemble of Baroque instruments was conducted with élan by Neal Goren, and the production directed and choreographed elegantly by Luca Veggetti. Saariaho is arguably the finest Finnish composer of our time (some days I prefer the more extroverted Magnus Lindberg), and The Tempest Songbook is a collection of occasional pieces which she wrote over the course of around ten years (the oldest is from 1998). In each, one or two voices is accompanied by a small ensemble. It’s minor work, but a good introduction to her unpretentious and accessible style. Recently she arranged these settings for a uniform ensemble of baroque instruments, and those versions are what Gotham Chamber Opera presented. Although the harpsichord made a comeback in modern music as long ago as the 1920’s (when de Falla and Poulenc wrote excellent concerti for Wanda Landowska), the recorder and lute are still rarely encountered in anything later than 1750. The resulting instrumental sound was often quite lovely, defamiliarizing the sound of the old instruments in a way that makes them seem fresh and new again. The texts chosen by the composer give each of the main characters a moment of their own (“Miranda’s Lament,” “Caliban’s Dream, “Ariel’s Hail,” “Prospero’s Vision”), with the last and most interesting (“Ferdinand’s Comfort”) superimposing Ariel’s “Full Fathom Five” and Ferdinand’s “Where should this music be?”. In truth there is little ‘operatic’ here, at most this is a song cycle and hardly even that. So to add visual drama we were given dancers (from the Martha Graham Dance Company) and video projections. Although not identified as such in the program, it appears that the amazingly lithe PeiJu Chien-Pott was Ariel (really the perfect embodiment of an air-spirit) and Abdiel Jacobsen was Caliban. They were joined by Ying Xin and Lloyd Mayor, masked and ambiguous, but clearly sprites of some kind. Ms. Zetlan also deserves extra credit here for joining seamlessly with the dancers in an acrobatic moment or two. It was sometimes hard to tell what the chosen movements had to do with the texts, but given the generally non-narrative nature of the lyrics this was perhaps inevitable. The lighting plot (by Clifton Taylor) was expressively supportive without drawing undue attention. Costumes (Peter Speliopoulos) were a bit too generic considering the specificity of everything else. The video projections by Jean-Baptiste Barrière, on the other hand, did not meet the level of the rest of the enterprise. Dancers repeating combinations stays interesting much longer than repeating pre-recorded video clips, even when those clips are layered on top of each other. The third time we saw a high-contrast visage staring blankly into space was already one time too many. The projections were mostly on the one major set piece, a very large irregular sphere which did not earn the space it occupied, even when hoisted above the playing area. It looks impressive in photographs, but mostly we would have been better off without it. Reportedly the idea for this program began with the choice of the Saariaho Songbook, but her contribution totals only twenty minutes. So she suggested alternating with the Baroque pieces which she personally considered complimentary. Drastically revised adaptations of Shakespeare were common until relatively recently, so much so that this one was better known than Shakespeare’s original well into the 19th century. It strays so far that it may be fairly called a travesty; the critic George Odell, writing in 1920, called it “the worst perversion of Shakespeare in the two-century history of such atrocities.” In any case, I mention all this to explain why we heard arias, purportedly after Shakespeare, yet featuring entirely new characters such as Neptune and Amphitrite. It’s always a pleasure to hear the sound of gut strings. (Fan alert: at the Metropolitan Museum this coming weekend, Matt Haimovitz will play all the Beethoven Cello Sonatas, using gut strings, accompanied by Christopher O’Riley on fortepiano). It was an even rarer treat hearing an archlute in concert, likely a first for me. The only addition that one might wish for would have been an oboe for the Baroque selections, as the recorder lacks carrying power. A glorious musical and theatrical evening from MasterVoices starring Kelli O’Hara and Victoria Clark plus a new prologue by Michael John LaChiusa. Celebrating their second annual performance event out in Forest Hills, The Pops crafted an evening full of Broadway standards and inspiring performances.